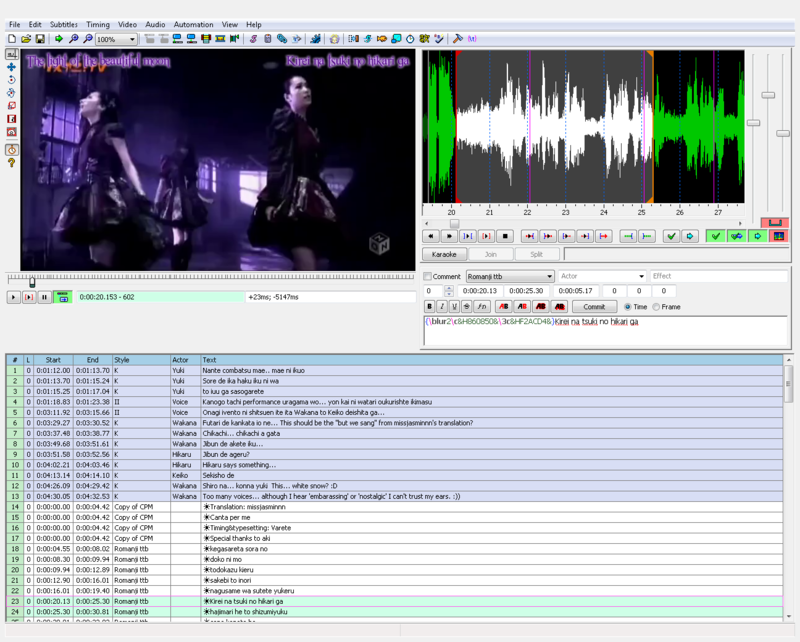 If the subtitle file is opened on a different video than the one used when doing the timing, there may occur differences in the synchronizing of the audio and the subtitle. Also, if you don't have the same fonts used by the one who made the subtitle, it will be shown differently than what you see in the videos uploaded by us. Does anyone know when these were from? The 3 last video from the unknown ones should be from the Kalafina Asia Tour (wasnt it on 2010) or the Hong Kong Red Moon live. It was quite the challenge to do this with my half-broken headphones, but here's the result of many hard working days a few hours. Or if you have critics/suggestions/observe any mistakes ponts at Equalizer, just let me know and I'll correct them. Its not him? I was wondering why does Revo speak so fluently in Chinese. Maybe I should point out that I've just started a few days ago the Sohu interview, part 1 and 2 are ready. So there won't be 2 people working on the same interview/mc/live etc. Kalafina Asia Tour @ Tencent - I've downloaded the video, probably in a few days I'll start working on it. Don't worry, I guessed that you made a summary of what they were saying. It's no biggie. ^ alrighty! i'll pm you the following parts soon! I could help to translate Chinese stuff a little (especially since I'm on holidays now), but do you not fear that there might be some meaning lost in translation, especially since one would not be working with the original Japanese words, but rather with a Chinese translation? Alright, give me some work then (via PM, and 1 at a time). I'll see what I can do. Great work on the translation, thank to anyone that involved. Now i can finally sit back and watch the interview while understanding it.